Crayon on paper , 17 x 13 3/4 inches framed. Paul Kasmin Gallery presents David Hockney: Works on Paper, 1961 – 2009, the artist’s second exhibition with the gallery on view since November 9 to January 13 at 297 Tenth Avenue. The exhibition presents a selection of Hockney’s recent East Yorkshire landscapes, as well as intimate portraits and set designs from as early as 1961 during his time as a student at the Royal College of Art. David Hockney’s interest in landscape and nature’s cycles was ignited in recent years after returning in 1999 to East Yorkshire, England a lush area near his hometown of Bradford. In composing his landscapes, Hockney would continuously return to the same location in order to capture the gradual changes of seasons across a range of media. 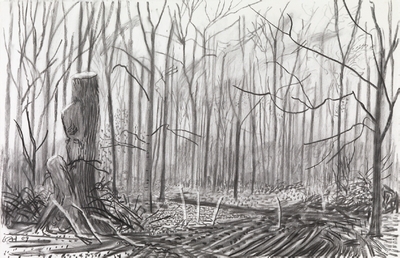 The exhibition features four charcoal on paper works including Hockney’s Autumn Thixendale, October 19th, 2008, and Fresh Timber on Woldgate, 2008, that emphasize the soft, organic forms of the foliage in play with the seasonal weather, flanked against stark farming patterns of the Yorkshire countryside. 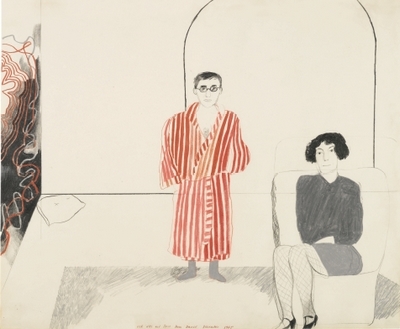 Created at the outset of his career, David Hockney’s drawings from the 1960s and 70s capture the development of what would become his iconic and inventive style, often reflecting on his travels and friends of the moment. In Kasmin,1973, Hockney uses pencil on paper to depict his art dealer seated in a Parisian studio that once belonged to Balthus. This work was made at a time when Hockney “was trying to break out of something…of what [he] called ‘obsessive naturalism.” Executed years later, Peter Langan, 1981, is a compelling example of Hockney’s portraiture, made with the most economical of marks and clever for the innovative approach to scale with respect to the head within the composition. The exhibition coincides with the major retrospective, David Hockney, at The Metropolitan Museum of Art, New York, which had staged earlier this year at the Tate Britain, London and Centre Georges Pompidou, Paris.